To comply with the CAN-SPAM Act of 2003, marketing emails must include the physical mailing address of your business and a link for contacts to manage their email subscription preferences. All marketing email campaigns sent through HubSpot are required to follow these guidelines. Please note: in addition to CAN-SPAM, other countries may have their own laws surrounding consent for marketing email. Be sure to research and follow any other guidelines that apply to your customers. By default, HubSpot includes HubL tokens that populate with your office location and links to your email subscription pages. These tokens are included in the Office Location Information module of all HubSpot email templates. You can also use HubL to send contacts a link to manage their subscription preferences in the body of your email. On the left sidebar menu, navigate to Marketing > Email. In the Footer section, click Edit to update your company's name and address. The Office location name, Company Name, Address, City, and State fields are all required. Enter the required fields for your office location information, then click Create. 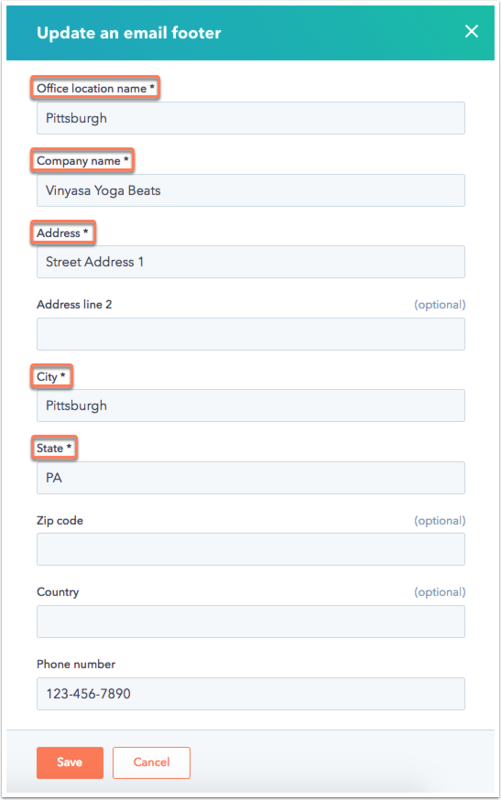 You'll see additional office locations in your Footer settings. To set a default location, click Make default. To delete an email footer, click Delete. Since your office location information is required for all marketing emails, your default footer can't be deleted. Use the Office location dropdown menu to select an office location. To edit your office location for this email only, click Edit email footer contents. To update your saved office locations in your settings, click Manage to open your email settings and edit your saved email footer information. 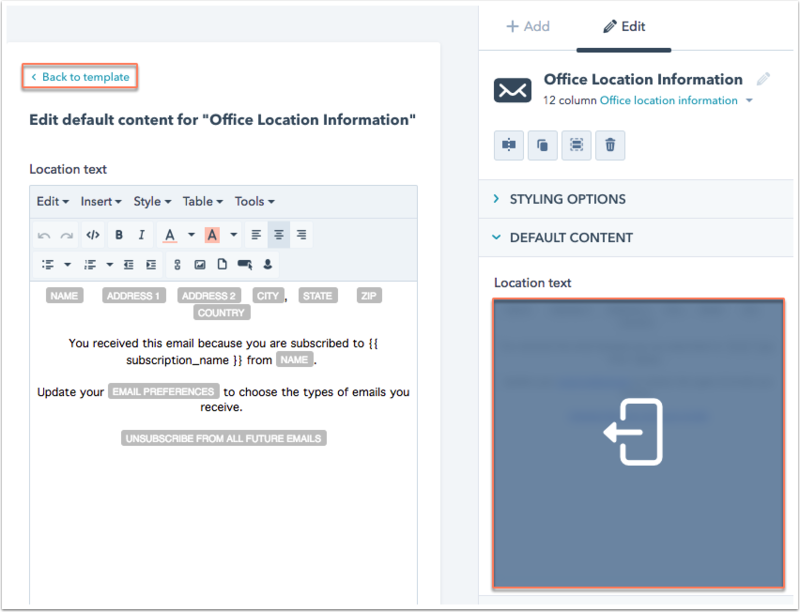 To customize the content of your CAN-SPAM email footer, edit the Office Location Information module of your template in the design manager tool. Since email templates don't support global content, this information must be customized on a template-by-template basis. Please note: this functionality is not available for drag and drop emails. if you're using a custom coded email template, learn how to add the required CAN-SPAM tokens in our Designers Documentation. Click on an email template in the finder to select it in the editor. Click on the Office location information to select this module for editing in the inspector. To edit the styling of this module, click Styling Options to expand options for the module's default fonts, colors, and spacing. 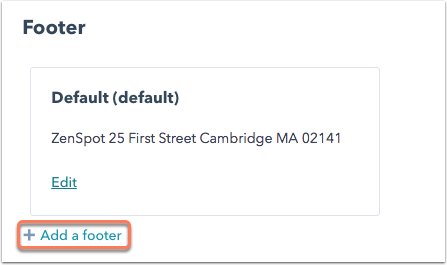 To edit your email footer content, click the Default Content section of the inspector, then click the Location text to modify the default content in in the editor. After making your edits in the rich text editor, click Back to template.